Consulting firms join together to tackle issues of diversity and inclusion in the industry. MCA member firms are pledging to take action to promote greater diversity and inclusion within the consulting industry. The pledges from firms and their leaders came as the MCA itself launched its Year of Diversity, a programme of events, research and other activities. On Thursday evening, over 100 consultants and HR from MCA member firms met to launch the Year of Diversity. The campaign will examine the challenges consulting firms face on the Diversity and Inclusion agenda and promote the innovative solutions they are developing. The launch event, hosted by Deloitte, saw an expert panel examine how consulting is meeting the call for greater diversity in the workplace. Data shared at the event from two recent MCA surveys highlighted issues of gender balance, ethnicity and educational background in the consulting industry. LGBTQ, nationality, age, disability, mental health and socio-economic group were also discussed. The panel, made up of leading diversity figures, shared their own experiences and initiatives and debated both opportunities and challenges facing the industry. The panel consisted of Liz Bingham OBE, Managing Partner and Ambassador for Diversity and Inclusiveness at EY; Nadun Muthukumarana, Partner at Deloitte; Mark Palmer, Managing Director at OEE Consulting; Sharron Pamplin, HR Director UK & Europe at Atkins and Claire Stokes, Partner at PwC. 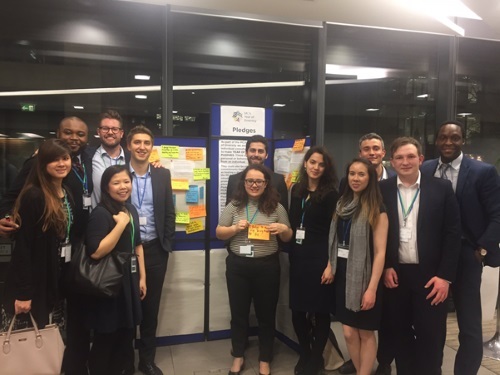 Attendees were asked to make their own diversity pledges on the evening, both as individuals consultants and on behalf of their firms. Examples included reviews of recruitment policies, the introduction of new procedures to promote diversity and setting relevant diversity targets, as well as personal and behavioural commitments. The MCA is encouraging all firms to make pledges throughout the year via the MCA website. “Across the Year, we will explore a range of issues. We will focus particularly on what makes for an inclusive culture in consulting and how that culture can bring business benefits. But we will also consider a whole array of important topic areas, from gender, ethnicity and race, LGBTQ, nationality, age, disability, mental health, education and socio-economic group.